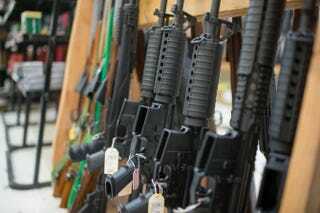 Guns are on display at Roseburg Gun Shop in Roseburg, Oregon, on October 2, 2015. The young daughter of an Idaho milia member was shot and wounded on Sunday after a meeitng of the III% Idaho group, Raw Story reports. The 12-year-old girl was not identified, but was taken to the hospital by helicopter for treatment after the shooting at Rupert Gun Range. The girl's mother said that the girl was in stable condition as of Monday morning, and that the shooting is under investigation, the Twin Falls Times-News noted. According to Raw Story, President of the state III% militia groupm Brandon Curtiss, provided some details about the incident in a Facebook post on Sunday. Curtiss said that while cleaning a weapon there was an accidental discharge. The bullet reportedly hit a metal table before richocheting and hitting the 12-year-old in her stomach, before exiting through her side. The little girl was reportedly able to tell her father she loved him as they loaded her into the helicopter. Curtiss encouraged individuals to contribute to the III% Idaho group's PayPal account and to specify that their donations were for the girl's family. Read more at Raw Story and the Twin Falls Times-News.